Just how subservient to Barack Obama is the Fed? We’ll soon find out. The Fed is considering pumping more money into the economy and inflating the currency by the end of September, just in time to artificially stimulate growth and help Obama’s reelection prospects. Just two weeks ago, Senator Chuck Schumer told the Fed it should act before the 2012 election. Republicans are urging the Fed to be more cautious, but Democrats, frightened at their reelection chances, are pushing the Fed to save them and worry about the future later. After the Fed had their June policy meeting, Fed officials started to publicly muse about pouring more money into the economy. And with meetings coming up on July 31 and August 1, it’s possible the Fed may act soon. Fed Chairman Ben Bernanke told Congress last week that the Fed was considering several ideas: buying mortgage-backed or Treasury securities, keeping short-term interest rates near zero beyond 2014, or dropping benchmark short-term interest rates even lower than they are now. Other ideas include using a facility the Fed calls its discount window to give cheap credit directly to banks that make new business or consumer loans. But the banks can get cheap credit already. The Fed is worried about new figures that show how drastically the economy is failing: it grew at a rate well below 2% in the second quarter after its growth was only 1.9% in the first quarter. The unemployment rate has been stuck around 8.2% since January. Retail sales are down, and Europe, which is a mess financially, isn’t buying American. Fed “hawks” are more concerned about inflation resulting from easing the path toward inflating the currency, but are keeping mum for now. “I know people feel like we haven’t made enough progress,” James Bullard, St. Louis Fed president, said, allowing that he would go along if inflation falls too low or if the economy takes a brutal hit. Some officials are counting on “Operation Twist,” under which the Fed is buying $267 billion worth of long-term Treasury securities and selling an equal amount of short-term securities so they can depress long-term interest rates to spur spending and investment. But the option creating the most dissension is “quantitative easing,” or QE, in which the Fed has been acquiring long-term securities with newly created money. It has already been tried twice, once in 2009 and early 2010, when the Fed bought $1.25 trillion worth of mortgage-backed securities and $300 billion of Treasury securities and debt issued by Fannie Mae and Freddie Mac, and a second time in 2010 and 2011, when the Fed bought $600 billion of Treasury securities. 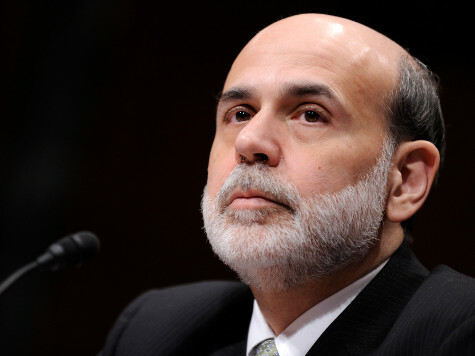 Bernanke has said repeatedly that the Fed will not take political considerations into account. We’ll find out soon if he is telling the truth.